The No. 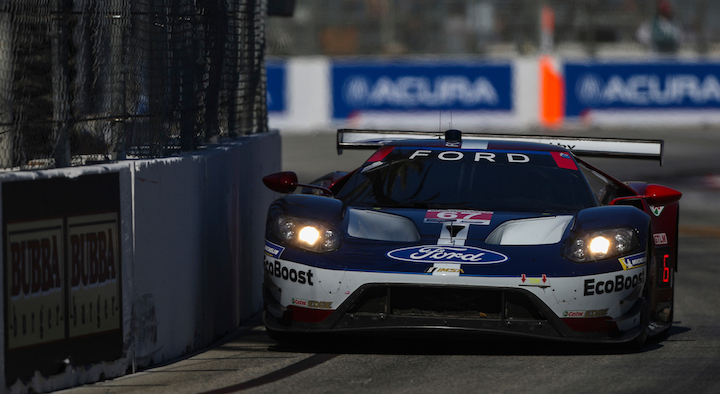 66 Ford GT of Dirk Mueller and Sebastian Bourdais suffered an unfortunate end to Saturday’s Bubba Burger Sportscar Grand Prix from Long Beach. Bourdais, who was filling in for a sick Joey Hand in the No. 66 Ford GT this weekend, qualified an impressive fourth for Saturday’s race. After getting a strong start, Bourdais handed the car over to Dirk Mueller, who then began to work his way through the field and found himself leading the GTLM class by the end of the first round of pit stops. Disaster struck for Mueller about 45 minutes in, though, when the German driver accidentally hit the pit limiter button on the steering wheel of his No. 66 Ford GT. This allowed the No. 912 Porsche 911, which started second in GTLM, to easily sail past and claim first. The No. 66 then held off a hard-charging No. 3 Corvette C7.R when Mueller ran out of fuel with just two laps to go. Jan Magnussen in the No. 3 Corvette then punted the Ford GT out of the way as he accelerated, expecting the Ford GT to have accelerated at the same rate. In the end, the No. 912 Porsche 911 took the win, while the No. 3 Corvette and No. 4 Corvette capitalized on the Ford team’s errors to take a double podium. The No. 67 Ford GT, which didn’t have the same pace as the No. 66 sister car, finished sixth in GTLM ahead of the two BMW M8 GTLMs. IMSA heads to Mid-Ohio next for the 2019 Acura Sports Car Challenge on Sunday, May 5th, 2019. Click here for full results from the 2019 IMSA Bubba Burger Sportscar Grand Prix. Wow – either Magnussen took that turn like a God, or Mueller botched it. The Corvette had way more speed coming off the apex. Move it or lose it Ford!!!! Well if the Ford hadn’t SOMEHOW got into the front of the pack by a LUCKY HAPPENSTANCE of a former Ford driver breaking down on track exactly at the right time then the 66 wouldn’t have even been in the way. Just like LeMans with bop before the race right Ford? Hardly the fault of Corvette when Ford GT driver hits the pit limiter. Had the Corvette been in front of the Ford and hit the pit limiter the same would have happened. Stop crying Ford!